I haven't sent out any requests since October, so I was surprised to get one back today. 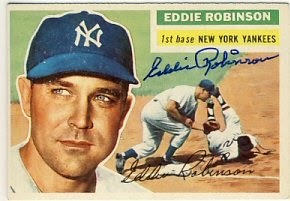 Eddie Robinson signed his 1956 Topps for me. I've been ordering a few magazines to get signed at TwinsFest lately. 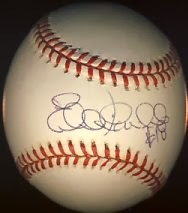 One seller also had an Eddie Guardado signed baseball for less than the price of a ball, so I bought it. It's also JSA authenticated. The list of players appearing at TwinsFest is up on the Twins web site. It's pretty much the list you'd expect. I always hope to see a few more ex-Twins. Players like Doug Mientkiewicz or Dave Winfield. The players listed so far are great, but most have been there in the past. I see the Twins signed Jason Kubel to a minor league deal. I hope to see him at TwinsFest, but he's not on the list so far. I'm not sure he's a great choice as a DH. I'd think Target Field is better suited for a right-handed hitter. Today I ordered my TwinsFest tickets. I'm not sure what to expect this year, since it's being held at Target Field. Both my sons and I are going on Friday and Saturday, and I'm going alone on Sunday, since they have a baseball clinic that day. I have a lot of bobbleheads I want to get signed. Mostly giveaway bobbleheads like Blyleven, Gardenhire, Gladden, Hrbek, Willingham, etc. I saw Greg Olson's name on the list early, but then it disappeared. I'd really like to have him sign the Sports Illustrated with him and Gladden colliding at the plate. It's already signed by Gladden. I'll probably work on the 2013 Topps Heritage and Allen & Ginter sets as well.